Jason Lambert was born in Newark on Trent and started to learn the piano at the age of nine, going on to learn the organ at the age of sixteen. He went to Ripon and York St John University and gained an organ and piano scholarship with the Cathedral organist of Ripon Cathedral and with a professional pianist. He graduated in 2001 with a BA Hons degree in performing Arts. Whilst at the college he conducted the chamber choir at Canterbury Cathedral and also sang in the university choir. He worked in different genres of music whilst at university and became musical director of the all female student St Cecilia choir during his PGCE year. He is currently accompanist for Phoenix Male Voice Choir and has played for the Norfolk and Norwich Operatic Society, and local churches. 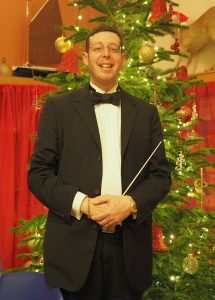 He also has played at the Maddermarket Theatre and performs with professional soloists and other local groups.